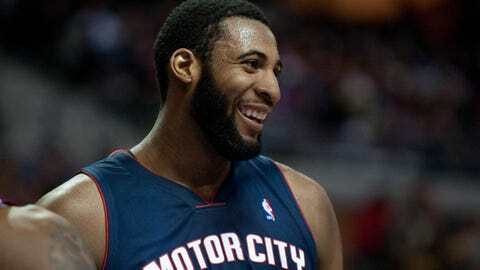 Andre Drummond is averaging 12.6 points and 12.7 rebounds this season, while shooting 60 percent from the floor. Andre Drummond is heading to New Orleans for Valentine’s Day. The Pistons center was selected Wednesday to take part in the Rising Stars Challenge, a game highlighting the league’s top rookies and second-year players. Drummond is averaging 12.6 points and 12.7 rebounds this season, while shooting 60 percent from the floor. Dwight Howard and Wilt Chamberlain are the only players in NBA history to put up those numbers for an entire season. The game, scheduled for Feb. 14 as part of All-Star weekend, will also feature a pair of rookies from the Michigan team that went to last year’s national championship game — Trey Burke and Tim Hardaway Jr. While the game used to pit rookies against sophomores, the squads are now drafted by celebrity coaches, so Burke and Hardaway won’t know for a couple weeks if they will be teammates again.